Following the score he completed and released for Derrick Scocchera’s short film, A Perfect Place, alt-composer Mike Patton has decided to apply his talents to something a little more Hollywood. 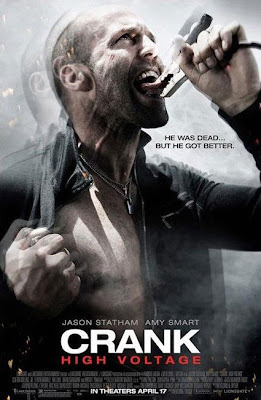 Crank 2: High Voltage has been given the Patton treatment. Both the movie and Patton’s score will be released on April 17th. Being the anti-mainstream presence that he’s been for the last twenty years, something as big-budget as a Crank sequel seems somewhat of a strange place for Patton to apply his vision. Yes, he did lend his voice for I Am Legend and a slew of videogames, so he’s definitely been moving toward more accessible creative outlets. Film is obviously an industry he wants to tap into from a compositional and musical standpoint. I’m sure he looks at it as work, just another project to sink himself into, prolific workaholism that won’t necessarily reside in his familiar environment of obscurity. Plus, it could be good exposure for Ipecac. Economically speaking, any tactics to keep an independent label running in the current marketplace are encouraged, especially amidst a climate that killed Touch & Go and led to layoffs at Alternative Tentacles. Maybe a little mainstream entanglement has become necessary.